This is an interesting book, in parts, but it is also a missed opportunity. 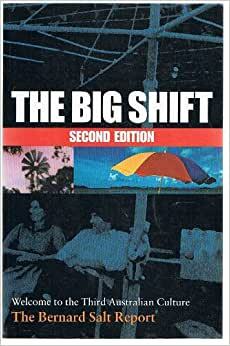 The "big shift" refers to the increasing number of Australians who are moving to live close to the beach. The "third Australian culture" refers to the Australian beach culture which Salt says follows from the first Australian culture, that of "the Bush", and the second Australian culture, which was the move to the suburbs. The reality is that the Australian beach culture is nearly as old as the bush culture and the shift to the beach has been going on for a long time. The other thing about the shift to the beach is that it is blindingly obvious to anyone who lives in Australia or visits the country, so this is not a great revelation. There are many reasons why this shift is taking place: changes in outlook, the emergence of lifestyle aspirations, availabilty of land and infrastructure, demographics, affluence and so on. Unfortunately, Salt provides a rear-view mirror account of what has occurred, based on population statistics with little analysis of why it has occurred. This is the great missed opportunity of the book. Most of the book does not deal with the shift to the beach. The "book" on the Big Shift is contained in the first few chapters. The rest is padding of one form or another. This padding is so obvious that chapters have no logical sequence and there isn't even a conclusion. It's just a jumble of writings. The author, Bernard Salt, is a consultant who provides demographic-based advice to business. His public presentations are well thought out, professionally presented, logical, informative, useful and (at times) amusing. All the things that most of this book is not. Let's hope that he is able to bring these attributes to his second book, The Big Picture: Life, Work and Relationships in the 21st Century. When it was published in its second edition this lively told story of changes to Australian demographic trends created something of a stir, not so much in academic circles but in the popular press and wider afield. Salt faces a big challenge here -how do you make statistics interesting to the general readership, let alone popular press journalists with a 10 minute attention span? As a qualified demographer (and working for a consulting company) Salt has now established himself as a regular commentator in the Australian business press with his discussions on population shifts in Australia. His work has confirmed many popular thoughts: that Australians are moving inexorably to the coast to live, that inland cities are being denuded, the attraction of coastal towns for retirees and, that Australia's most unplanned city, the Gold Coast , is also Australia's biggest growing city, unlike its well-planned but much colder counterpart Canberra. The trends show that inland mining towns like Whyalla in SA are the "losers", although this edition was published in 2003, well before the recent mining boom in Australia. He finishes with some comparisons to the USA where similar trends are seen in population movements to warmer climates. For casual readers, this is a worthwhile addition to your library but a later edition would be more relevant.